WorkPuls or WebWork? Which Time Tracker Would You Choose? WorkPuls or WebWork? What would you choose? In our digitally-managed world, time tracking and employee monitoring tools are highly important for managing teams and projects. Especially if you have a remote team, it is a must-have tool for you. As remote work is on the rise, the market of time trackers has become incredibly big. Thus, to choose the tracker that best fits your company needs is quite a tricky thing. That’s why our team is making comparison reviews of time trackers to help you get the tracker that suits you the best. 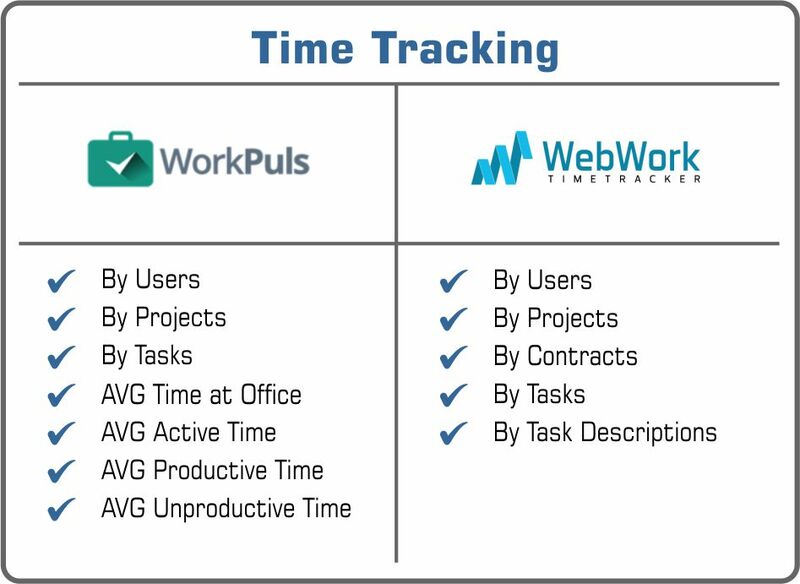 This time we have chosen to compare 2 time tracking and employee monitoring software: WorkPuls and WebWork. Both trackers are designed to accurately track time and monitor employees, however, they have several differences in both pricing and feature terms. Our “WorkPuls or WebWork” comparison review is comprised of 3 parts: Feature comparison, Price comparison and Overview. 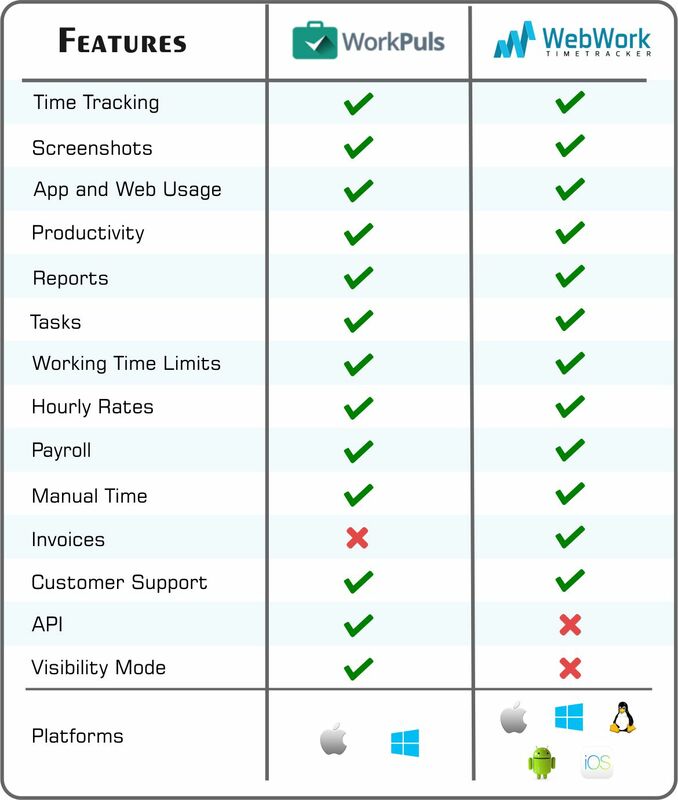 So, let’s start with a table of “WorkPuls or WebWork ” feature comparison. Now, let’s dive deep in “WorkPuls or WebWork” comparison and consider each feature in details. 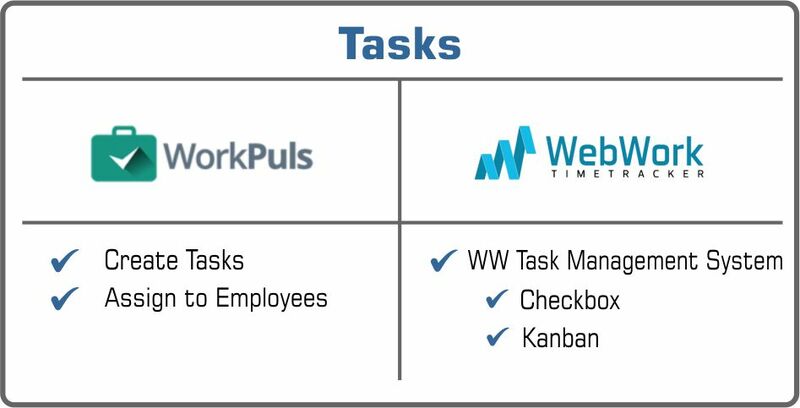 WorkPuls tracks time by projects, tasks, and users. You should choose the project and the task you want to track time on and press the start button to start tracking. The tracker categorizes your tracked time as productive and unproductive, estimated by your web and app usage. It also shows the average time spent at the office and the average active time. WebWork accurately tracks the working time by projects, contracts, tasks, users and task descriptions. On the dashboard, you can see the overview of your tracked time in colorful charts. For accessing more detailed information and various filters, you should go to the Reports page. Screenshots are taken on an hourly basis. Screenshot frequency can be 3, 6, 12 or 20 screenshots/hour. Otherwise, you can turn the screenshots off at all. Employers can give their employees access to view and remove screenshots. On Screenshot mode, a little pop-up window appears and notifies the user about the screenshots. The user can save or delete the screenshot. If the screenshot is deleted, the tracked time will be removed as well. On background mode, the tracker takes screenshots without notifications. Later, you can access them on Screenshots page and decide whether to keep or delete them. You can turn on the Screenshot Blur mode and all the captured screenshots will be blurred. Otherwise, you can turn off the screenshots and the tracker will not take screenshots at all. Also, WebWork has the screenshot feature for dual monitor users. WorkPuls shows all the websites and applications that employees use during the tracked time. The employer can see which websites and applications has been used, by whom, and the period of time of its usage. 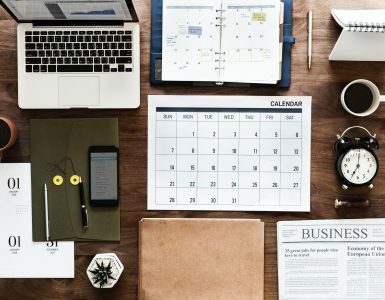 Moreover, the employer can categorize the websites and apps as productive and unproductive and see which app or website the employees are using at the moment (real time). WebWork records all the applications and internet usage during working hours. The information is accessible in the Active Window Report. It includes the name of the active window, the project and the user, and accordingly, the duration and the date of the active window usage. It is also possible to group this information by the active window. The productivity is estimated by website and application usage. The employer categorizes apps and websites one by one as productive or not productive. Hence, the time tracked on web pages or applications that are not categorized is the neutral time. The date is visualized in insightful charts by productive, unproductive or neutral tracked time. 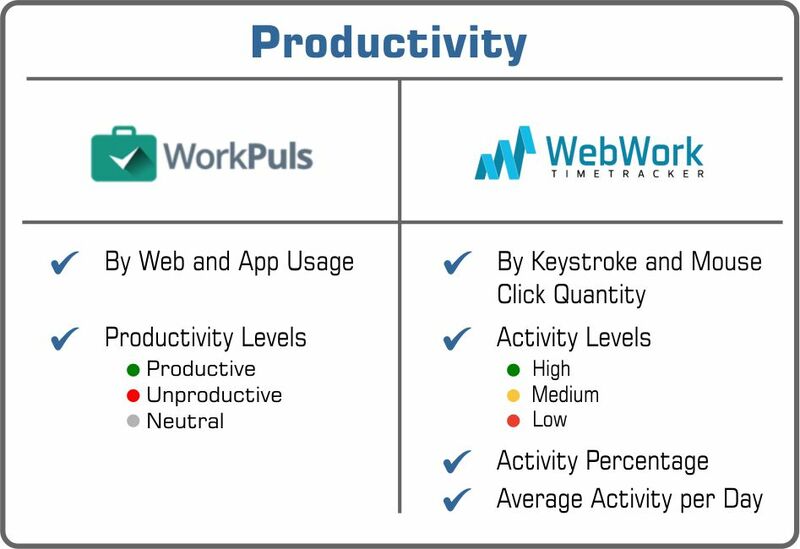 WebWork estimates each user’s productivity by keystroke and mouse click quantity. You can see the number of mouse clicks and keystrokes of every screenshot per 10 minutes, also, per every minute. There are 3 levels of activity: High, Medium and Low. Each of them has its specific color: green, orange, red accordingly. Every screenshot has its own activity level shown also by percentage. The average activity of the user is estimated on a daily basis. In the Time Attendance report, you can access information about the clock in and clock out time of employees, office time and all activities, as well as productive unproductive and neutral time. The App and Website usage report is comprised of Total usage, Per hour usage, Per employee usage. You can see how much time is spent on which app or website and by whom. 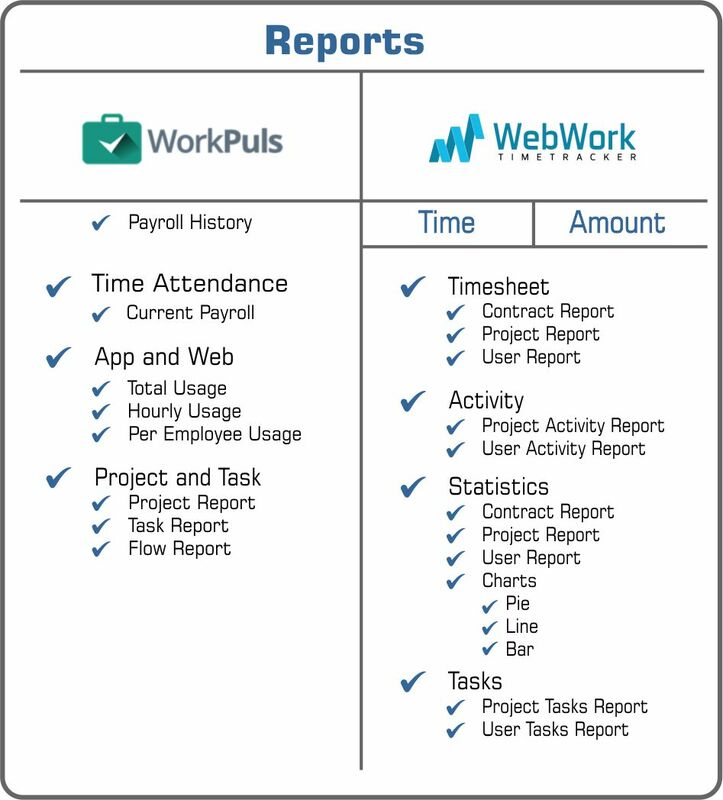 WorkPuls also provides reports by projects and by tasks. The report shows the total tracked time and the total cost of the project. Reports can be exported in CSV format. Reports can be generated by projects, by contracts, by tasks, and by users. You can see the overview of tracked time in insightful charts: Pie, Bar and Line. You can generate reports by day, by week, by month or specify a certain date range. Also, you can filter your reports by users, user groups and project tags. All the reports can also be generated by the amount of money estimated by billable hours. You can export all the reports in XLS, CSV or PDF formats. The idle timeout is set to 120 sec. by default. You can change the idle timeout from the group settings and set it from 60 sec. up to 600 sec. WebWork’s idle timeout is set to 10 minutes. WebWork stops tracking if no keystroke and mouse click activity occurs within 10 min. A project can have many tasks. You can create tasks and assign one or more employees to them. Later, you can track time on particular tasks. There are 4 tracking scenarios. You can choose the unlimited scenario so that employees can track their time during the whole day without limitations. If you want to track your employees’ activities during the desired period of a day you can select the fixed working hours scenario. You can enable tracking for a fixed amount of time regardless of the start time, by choosing the flexible start scenario. In office time scenario, you can track employees’ activities only when they are connected to your company network. You can set weekly limits for each user and control how many hours your employees work on a weekly basis. You can set hourly rates per user in Employee Wages’ settings. Additionally, every user has an hourly wage and overtime wage. WebWork allows team owners to set hourly rates for each user. Consequently, you are able to track costs as well. 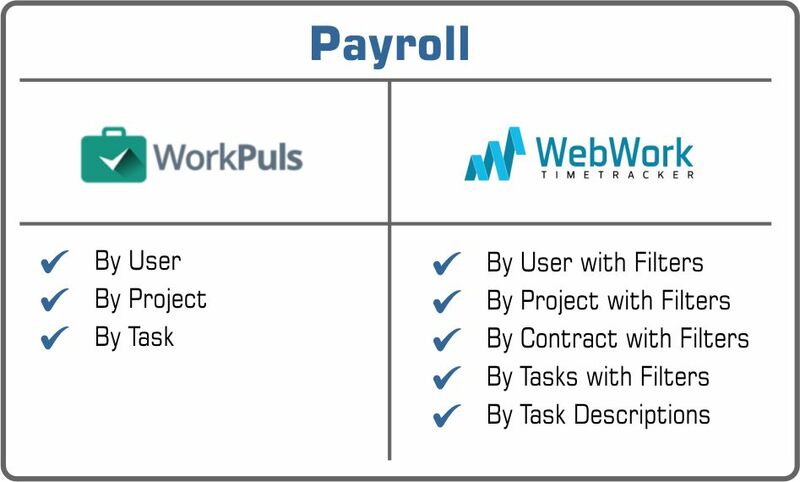 You can calculate payroll based on time tracked by WorkPuls. The information is provided per user for each day and the total sum. Also, you can find the amount calculated by project and task in the Projects section. All the tracked data is accessible by the amount of time and money. Thus, you can calculate your desired payroll using various filters of users, projects, tasks, contracts and task descriptions. 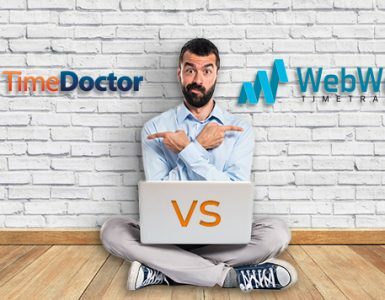 Also: Time Doctor or WebWork? Which Time Tracker to Choose? 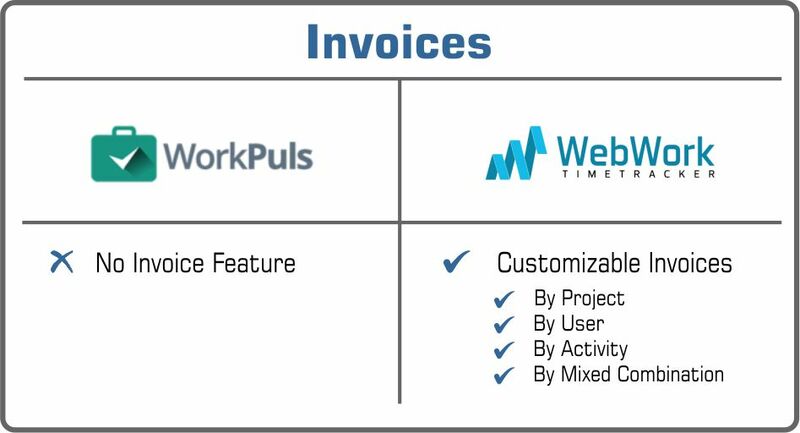 No Invoice feature is available in WorkPuls. You can generate invoices based on billable contracts. Furthermore, invoices can be generated by projects, by users, by activities or by other mixed combinations. You can customize the invoice by uploading your company’s logo. 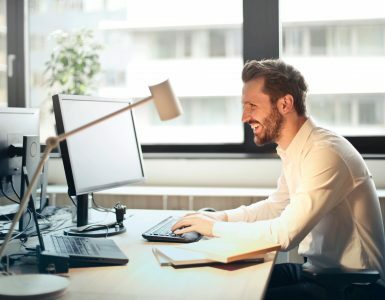 Employees can manually add time for non-computer-related activities. Then, these activities can be approved or denied by the employer. Users can request to add a manual time. The Team Owner or Manager will be notified via email or a notification in WebWork and can accept or decline it. After the added time is accepted, it is added to the timesheet. WorkPuls has a very simple live chat on the bottom-left of the website. You can also communicate with customer support team by email. In case of annual subscription Workpuls additionally offers phone support. 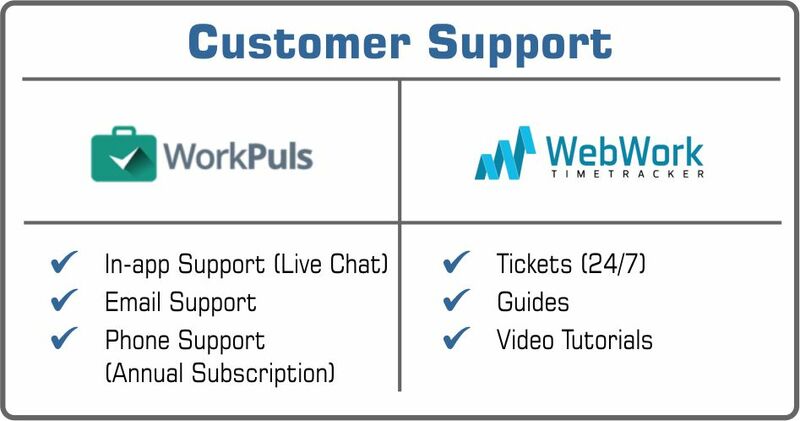 WebWork has 24/7 support by tickets. You can open a ticket any time you have a question or issue. The support team will get in touch shortly. WebWork also offers Guides and detailed video tutorials for WebWork usage. 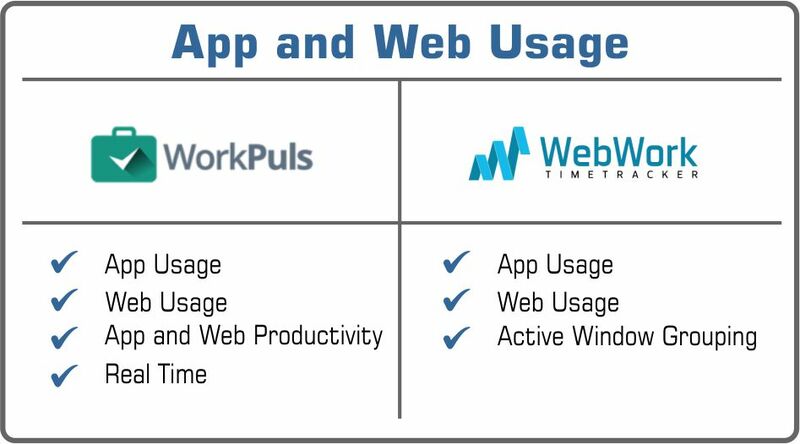 You can integrate applications with WorkPuls through Rest API and get data from your WorkPuls account. The icon of WorkPuls will be visible on employees’ desktop. Therefore, the employees will be aware that the application is running. On stealth mode, you can monitor your employees working time without their knowledge. The employee is always aware of being monitored by WebWork. The tracker is committed to the safety, privacy and integrity of your personal data. Employees have access to view and delete screenshots (the tracked time will be also removed). Now, let’s have a look at the “WorkPuls or WebWork” price comparison table. The cost per user per month is $6, and you should pay additionally for customized features. The annual plan is $57 per user. So, you can save 20% in case of subscription for a year or more. And the annual WorkPuls plan includes phone support for its annual subscribers. For teams with 2 and more members, the team owners pay only for membership of its employees and managers and don’t pay for themselves. Furthermore, the owner can invite an unlimited number of clients free of charge. For example, for the subscription of 5 users (owner included) and 3 clients, the owner pays only $11.96 (4*$2.99) for 4 employees or managers. For big teams with more than 40 members, WebWork offers custom discounts depending on the number of members and the subscription period. 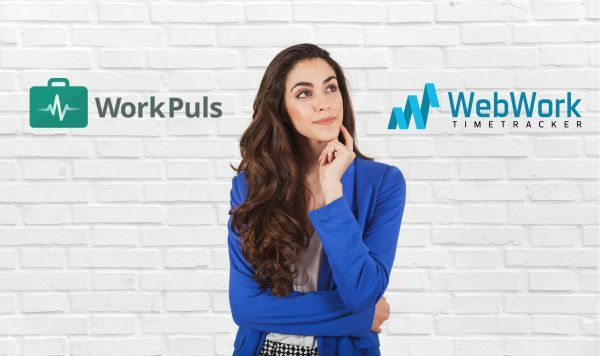 WorkPuls offers 7 days free trial. You can use WorkPuls with all of its features during the trial. Then, you should pay in advance to have access for the next month or year. According to the “Use Now – Pay Later” pricing policy of WebWork, subscribers should make a payment only after using the app for a month. Thus, employers can register, add employees and work on their projects without any limitations. Later, on the 25th day of membership, the team owner will receive an invoice which can be paid or not. Once the payment due date is expired, the account will be blocked. Otherwise, if the owner makes the payment, the account will be active until the end of next month. The price for individuals is the same $6/monthly and $57/annually. Additionally, you can also invite as many clients as you want. WebWork is free for individuals without any limitations in the features. Also, solo users can invite an unlimited number of clients. Related: Hubstaff or WebWork? Which Time Tracker to Choose? Here we are! Now, we have a detailed comparison of both prices and features. So let’s sum up our “WorkPuls or WebWork” comparison review and reveal the main differences. One of the major differences is the productivity level estimation. To estimate the productivity of your employees in WorkPuls, you should review the used websites and applications as productive or unproductive. Accordingly, the productivity of employees is estimated by productive and unproductive time based on web and app usage. In case of WebWork tracker, the productivity level is determined by the number of keystrokes and mouse clicks. You can see the activity levels of employees per 10 minutes or per day. Another difference is that WorkPuls offers visibility modes, particularly allowing you to monitor your employees without their knowledge. In terms of WebWork tracker, employees are always aware of them being monitored. They choose themselves when to track their work time and can remove tracked time by deleting screenshots. 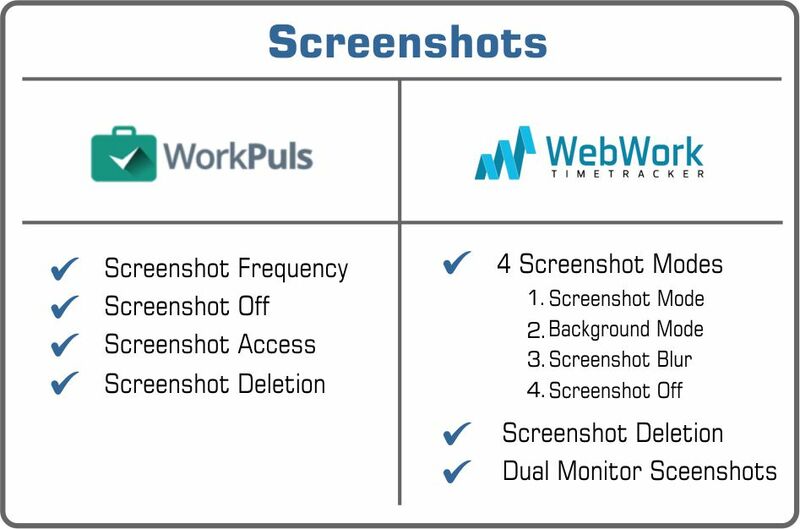 Concerning screenshots, WorkPuls allows you to choose the screenshot frequency, while WebWork has the screenshot blur mode and dual screen monitoring. The Timesheet reports and Payroll have more advanced options and filters in WebWork tracker. Additionally, you can generate customizable invoices with WebWork. 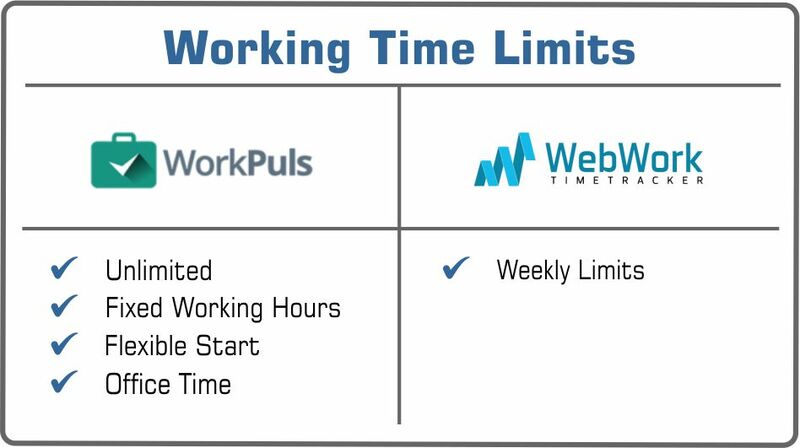 With WorkPuls you can fix working hours, while with WebWork you can only set weekly limits. In terms of prices, WebWork is 50% cheaper for a monthly subscription and 37% cheaper for an annual subscription, and the subscription of the team owner is free of charge. In case of WorkPuls, you should pay for each user and in advance after the 7 days free trial. WebWork team owners’ subscription is free of charge and the payment for the team can be made after 25 days of subscription. So, here is the overview of “WorkPuls or WebWork” comparison review. Hope this will help you to choose the time tracker that meets your time tracking and employee monitoring needs the best. 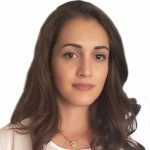 A learner by day, and a reader by night, Anna is a dynamic Digital Marketer in today's dynamic digital world. 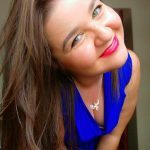 She specializes in Social Media Marketing and Content Marketing, claiming both to be the ever cornerstones of Digital Marketing. How to Eliminate Distractions At Work?